I said at the beginning of the year that I would be writing more personal book reviews, of ones that I've bought rather than just of ones sent to me. 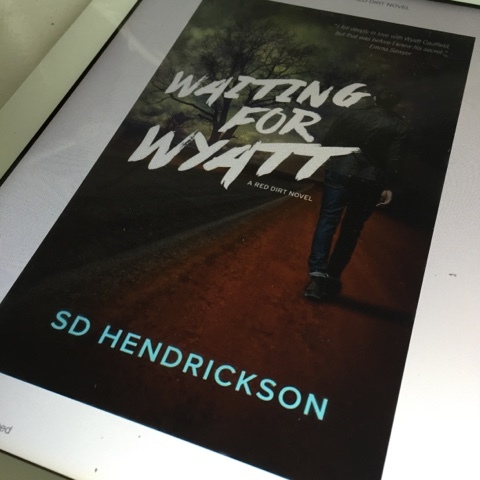 So I'm kicking things off with a review of SD Hendrickson's latest novel, Waiting For Wyatt. I really enjoyed The Mason List so this book was highly anticipated for me. I met Charlie and Wyatt on the same sultry, summer day. It was unexpected, leaving a feeling in the pit of my stomach like the time I drove too fast over Beckett Hill. The moment happened out of nowhere, all fast and quick and a little strange. Or maybe that was just Wyatt's personality. I think what drew me to this book in the first place was that it was a stand alone novel. There are so many books out there these days that are a part of a series and if I'm honest I hate waiting for subsequent books to come out. The blurb of this book had me more than intrigued, the front cover gave nothing away but the story itself didn't disappoint. This is predominantly a love story. It follows the building of the relationship between Emma and Wyatt. Like most of us, both characters have things in their lives which they prefer to keep private, not necessarily a secret but not something they are willing to share with others at the drop of the hat. Emma meets Wyatt when she rescues a dog from her abusive neighbour, Wyatt works at a dog shelter, looking after rescued dogs whilst they wait to be rehomed. The attraction between these two is almost instant, I know what you are thinking, good looking girl and good looking boy, it's all been done before, I'll be honest when I started reading I too thought this was going to be another cheesy romance but there is a depth within this story, one that is not to be looked over. I didn't have instant liking to Wyatt, although he is described as good looking, he has what you would call a hard exterior, much like the front cover of the book he wasn't willing to give much away. Throughout the book I felt much more of a connection. Layers of complications were being peeled away and my emotions, much like Emma's were very much affected. You cannot help but feel for what Wyatt has been through. Now this is a hard book to review as there is something within the story that I don't wish to reveal, I think it would more than spoil the story. There is a twist that I couldn't have guessed and it brings with it much pain and angst but also a real feeling of empathy. This book is a romance but what I love is that the storyline about the rescue dogs isn't lost under the weight of it all. It ties in wonderfully and I think the dogs in some part are a reflection of what Wyatt is trying to gain throughout the story. In the end this book is defnitely romantic and wonderfully so but it also endearing and heartfelt. The feelings within the pages are deep and meaningful and in the end totally won my heart. I would highly recommend others read it too. I know what you mean about series of books. I want to move right onto the next book if there is going to be one and would rather read an older series which allowed for that to happen - too impatient to wait. The extract has made me interested in reading it. I love the idea of a twist which you can't guess. I'm getting fed up of reading books where I guess what is going to happen. I guess it can't be helped when you read a lot but I am getting a bit disheartened that there is nothing original out there anymore. ooooh this sounds like an interesting book to read! This sounds like an interesting one! It is sometimes hard to review a book without giving the twist away, but always important to avoid giving it away!